Why would these people appear to be so joyful? Is it that brief illusion that some power has been regained, that they can finally begin to feel more at home, at home? Is it the relief that comes from believing that the worst has passed, since the worst have withdrawn to bases out of sight? 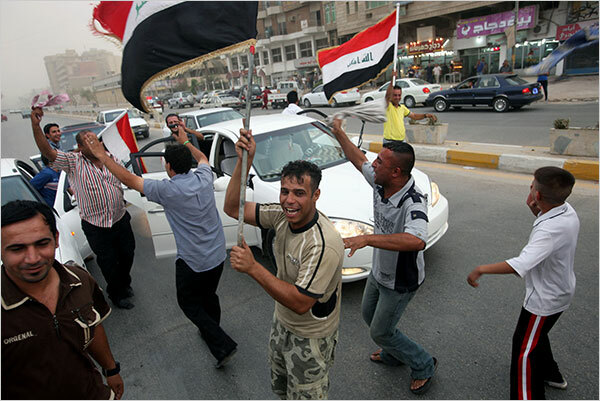 For Iraqis, claiming sovereignty is something of a national pastime, with various politicians celebrating different markers: 2004, when the American-led Coalition Provisional Authority handed power to the interim Iraqi government; 2006, when Iraq seated its first constitutionally elected Parliament; and Jan. 1, when the security agreement took effect. Iraqis had to wait over six years before seeing a day such as this, even though 130,000 U.S. troops continue to remain in Iraq, and some even in the same cities from which they supposedly withdrew (where they remain as “advisers”). At least 55 U.S. military bases remain in Iraq, some built as monster complexes on a permanent foundation. Iraqis get one more kick at that: a national referendum on 30 July, 2009, is widely expected to see a majority of Iraqis rejecting any American military presence in Iraq, which is likely to see the total withdrawal of U.S. forces next year, much sooner, and much larger than what the U.S. had planned (see here and here). As mentioned, some Americans, including commanders in Iraq, were “taken aback” by al-Maliki’s apparent dismissal of the role of U.S. forces in supposedly creating “security” (which itself dismissed the continuing violence that, once again, is rising). They were anxious to assure us readers that, really, the Iraqis are thankful: “Gen. Ray Odierno, the top commander of American troops in Iraq, brushed aside the dismissive tone of public remarks by the country’s leaders about the Americans, saying that Mr. Maliki personally thanked him Monday night and again Tuesday for the sacrifices the American troops had made” (source). Quite frankly, thanks were expressed, so it seems that the complaint is really that the Iraqis were not quite thankful enough, perhaps not sincerely passionate in their thanks, perhaps too happy in their celebrations. Otherwise, we witnessed the thanks from President Jalal Talabani: “While we celebrate this day, we express our thanks and gratitude to our friends in the coalition forces who faced risks and responsibilities and sustained casualties and damage while helping Iraq to get rid from the ugliest dictatorship and during the joint effort to impose security and stability” (source). Not to be outdone, the “Kurdistan Regional Government,” an entity that owes its very existence thanks to the U.S. invasion, sent out a press release: “The Kurdistan Regional Government (KRG) is deeply grateful to the United States and the U.S. military for their role in liberating Iraq, and partnering with us as we build our federal democracy. Thanks to the sacrifices and valor of U.S. and coalition troops…” — well the rest does not matter, this is a statement delivered in Washington by a Washington-oriented regime, which ended its press release on a defiantly subservient note: “We implore the Obama Administration to uphold its commitment to a phased, responsible withdrawal from Iraq….It is our hope that the U.S. withdrawal will be no sooner than the resolution of these key political issues within Iraq.” Now where did the Kurds get the impression that the U.S. was in a rush to leave? Perhaps most fittingly, Kipling predicted that when occupying a country and trying to better rather than being thanked by the people you would instead engender “the blame of those ye better” and “the hate of those ye guard.” Sadly, in watching the celebrations in Iraq I do not see an Iraqi people thankful for the contributions and sacrificial blood of American soldiers. I see them simply happy to see U.S. soldiers leave. Doubtless many Iraqis blame the U.S. and our soldiers for the violence and chaos that has been part of Iraq the last six years. To be frank, I never expected in my lifetime to encounter such short memories such as Witt’s, such willful blindness, such a grotesque sense of self-flattery from those who ghoulishly cheered shock and awe, and then piously mourned any mercenary who was rightly torched or beheaded. Thank you for what? The question cannot be what do Iraqis have to thank the U.S. for, but when will they ever be able to say that they have made America pay enough for what it has done. Is it then any surprise that people, who in their massive numbers have overwhelmingly expressed their hatred for the American presence in any poll ever done since the 2003 invasion, demanding that all U.S. forces be withdrawn immediately, and demanding that year after year, should now be reticent about saying, “Thanks America!”? What would lead an American commentator to believe that the U.S. could ever be forgiven for what it did to Iraq? The Financial Times ended its piece of non-euphoria with this bit of one-sided, unsolicited edification: “This is an important moment. But it is only the Iraqis who will decide whether they can summon the will to live together and put their nation and state back together” (emphasis added). Only the Iraqis who will decide — let us see who will decide to leave Iraqis alone for the first time in their modern history, and for long enough, to actually have a chance to decide for themselves. In the meantime, the real value of an annual “Sovereignty Day” is that it will stand as an ironic reminder of all that has not been achieved, all that belies the term, and what remains to be done. Reflecting on what sovereignty means, I cannot, but invoke Weber’s notion of “monopoly over violence”. The question of Iraq’s sovereignty today is ‘who really has monopoly over violence’ (mind you the oil control theories). Since the fall of the Ba’th regime, the explosion of forms of violence in Iraq turned the country into a multitude of deathscapes. Suicide bombs killing scores of people everyday, dead and dismembered bodies left in streets to disintegrate marking the territory of militias, mutilated corpses pulled out of the river, Interior Ministry affiliated Death Squads’ assassinations in broad daylight of individuals based on their sectarian background, the kidnapping, killing and body mutilation of bodies by organized crime and militia members, military raids, checkpoints, sky bombing, killing and torture by the American military and mercenary paramilitary contractors, are all part of the everyday necropolitics of the continuous war in Iraq. For many Iraqis, sovereignty day needs to be a day of reflection on the various forms of violence that they have undergone under Saddam’s regime, as well as the international sanctions (just to choose relatively recent moments in history) up to our present day. Since the invasion, different political parties and groups have capitalized on this violence, where each group claims itself as its ultimate victim. Within such politics of blame and revenge, it is easy for American commentators to state that Iraqis are ungrateful or turn the question of “why do they hate us” into “why do they hate each other” (as stated on the Times cover few years ago). Still there has been an absence of a single apology from any group in Iraq and outside Iraq (including the US and the international community) for their role in the destruction of the country. It is probably more appropriate to have an ‘international apology day to Iraq’, where everyone in the west, including Iraqis themselves, apologize to each other for their past and present actions. Then we can probably start thinking of lining up new national holidays (as the old ones were all disbanded). But until that day comes, we will keep seeing a race for declaring sovereignty through attempting (or maybe pretending) to monopolize violence in Iraq. Unsurprisingly, your discussion of the transformations of the flag is much better than mine! I wish I had seen it before posting, but I am glad you gave us that link. An international apology day — I am all for that. As far as symbolic reconciliations are concerned, it would be more important even that sovereignty day, for all of the many butcheries by all of the many butchers as you rightly point out. Apparently, in Biden’s world, Iraq has only recently become interested in self-rule and nationhood. Apparently Biden is less interested than Iraqis in recognizing their nationhood and desire for self-rule. Those who say Biden does a great job when he keeps his mouth shut, are right. Iraqis are skeptical that much will change after last week’s pullback of U.S. combat troops from Baghdad and other cities, a sentiment not shared by their government. 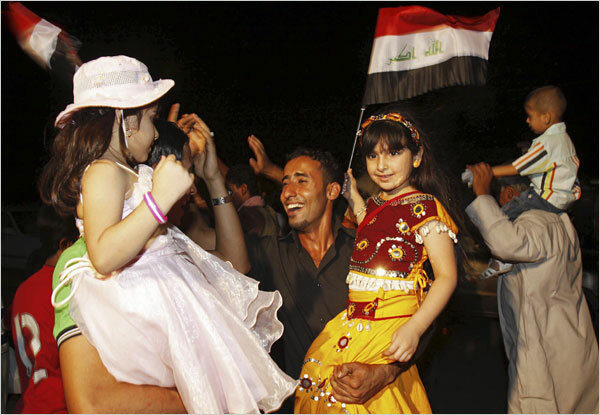 The government declared the June 30 pullback National Sovereignty Day and celebrated it with a military parade and noisy street celebrations by Iraqi soldiers and police. But there was no spontaneous outpouring of joy by Iraqis since many of them did not see the move as significant, with some 130,000 U.S. troops remaining in the country. ….Most troops pulled back to bases outside urban areas, but the U.S. military left an undisclosed number behind to train and advise the Iraqis. The U.S. military has refused to reveal their number, fearful of feeding any criticism that the Americans aren’t honoring the pact or casting doubt on the ability of the Iraqis to handle security alone. Excellent post, Mr. Forte. Thanks for seeing through the heap of illusions that the U.S. has tried to hand us. Notice how absolutely nothing in there supports your assertion, not even relating to it minimally. I don’t know if you are reading the article using an automated, online translation service, or if you are writing in English using such a translator, but either way there seems to be some serious misunderstanding and miscommunication taking place. Having said that, if I can assume to have understood your main points, all I can say is that yours is one point of view, and I don’t agree with it.